One night, all of the stars above Dream Land disappear. King Dedede has stolen them all from the sky and given them to his minions..
Kirby appears in King Dedede's castle as a ball. 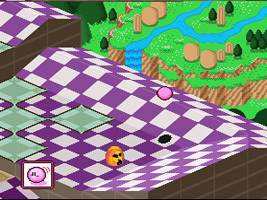 Use the power bars to determine the direction and angle to fire Kirby at, taking out enemies and landing in the hole in as few turns as possible. You have four turns per life and completing a course in less than four turns rewards you with extra turns and lives. Each enemy you defeat releases one of the stars. Clear all eight stages in each round to progress to the next round. You can also take part in a 2-player game where players take it in turns to clear courses.